Harold W. Roberts, son of John and Elfreda Roberts, was born on October 14, 1895, in the Noe Valley neighborhood of San Francisco, California. He was slight in stature and very energetic – filled with a zest for life and an active imagination. While still a boy, his family survived the great San Francisco earthquake of 1906. His mother died two years later, and he was sent to live with his German immigrant grandmother who lived in a Victorian house that still stands at the corner of 25th and Diamond Street. After graduation from the Wilmerding School in San Francisco, he took a short trip through Mexico. He then enrolled at the University of California at Berkeley. On October 14, 1916, while he was still attending the university, war began in Europe. Roberts, anxious to do his part, enlisted in the Army at Fort McDowell located on Angel Island in San Francisco Bay. After basic training at Fort McDowell, he was assigned to the Cavalry and sent to the Philippines. After that tour, as the United States was about to enter World War I, his regiment was sent to Camp Fremont, near Palo Alto, California. They were soon ordered deployed to France to fight the German Army. Roberts was sent with his regiment to the east coast and shipped over to France. There not being any used for mounted cavalry in the new “trench warfare” of WWII, a few were kept for recon, and Roberts himself transferred to the newly formed US Army Tank Corps. He was assigned to Company A, 344th Light Tank Battalion. Initially, the 344th was assigned to the 1st Division of the 304th Tank Brigade, commanded by Lieutenant-Colonel George S. Patton, Jr. Forty-five of the 2-man tanks were assigned to the battalion only two weeks before their initial action. 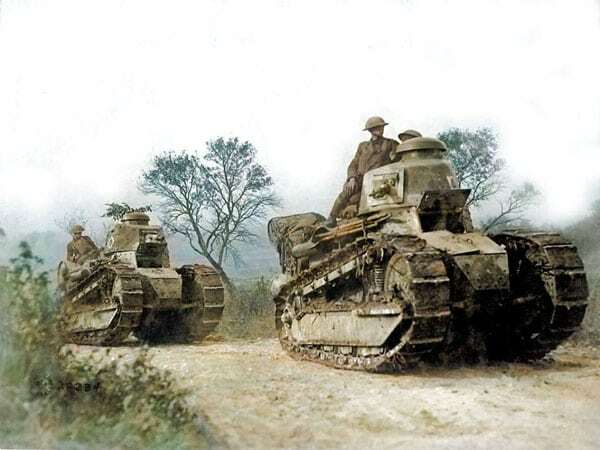 The tanks were French Renault FT-17s, weighing slightly over 7 tons and with a top speed of 7 miles an hour. Armament consisted of either a 37mm cannon or a .30 caliber machine gun. 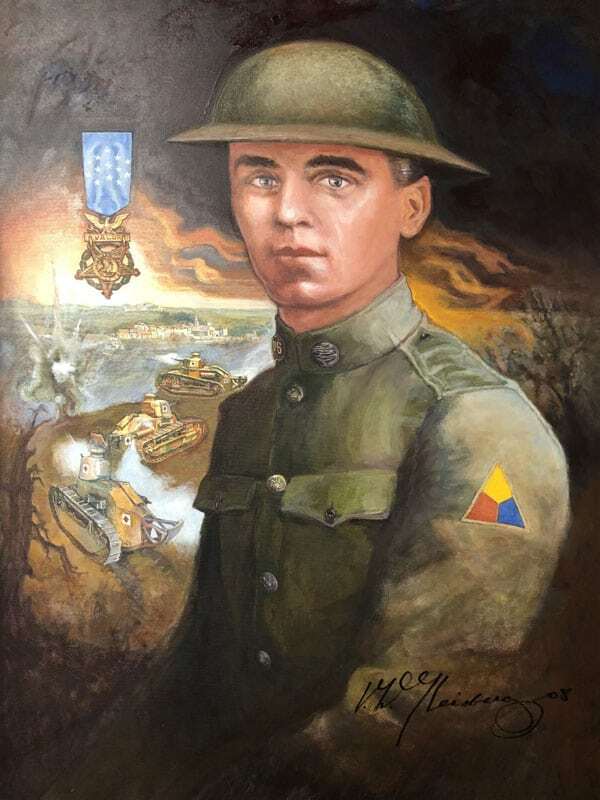 On October 4, 1918, shortly after his promotion to Corporal, his company was engaged in a fierce battle in the Montrebeau Woods during the Argonne Offensive–the last big offensive against the Germans that ended the war the following month. His company was advancing under heavy enemy artillery fire. After they had advanced about a mile, Sergeant Morgan and Corporal Roberts came upon a soldier crouched next to a disabled tank. As Roberts stopped his tank, the soldier crawled toward them, opened the door and asked for help. They said they could not help at the moment but would return after the battle to render aid and then drove off into the heart of the German artillery barrage. Ahead lay a large mass of bushes that they assumed was a machine gun nest, so they drove their tank into it. Their little tank slid into a large artillery crater filled with about ten feet of water. As the water rushed in, filling the tank up fast, Roberts said to Morgan, “Well, only one of us can get out, and out you go!” With his last bit of strength as he was drowning, he pushed Morgan out through the hatch. Morgan tried to assist Roberts, but with the heavy gunfire around the area, he was unable to do so. After the machine gunfire ceased, Morgan returned but found Roberts dead. On October 6, Roberts’ body was recovered from his tank. One of the personal effects found on him was a photo of his dog, Frisky. The Battalion Commander, Sereno Elmer Brett, recommended Corporal Roberts for the Medal of Honor–our nation’s highest award for valor in combat. 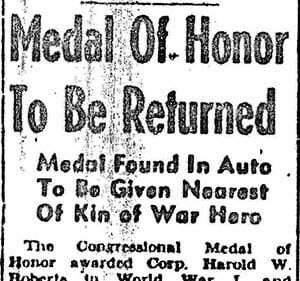 The posthumously-awarded Medal was given to his father, John A. Roberts, who died four years later. 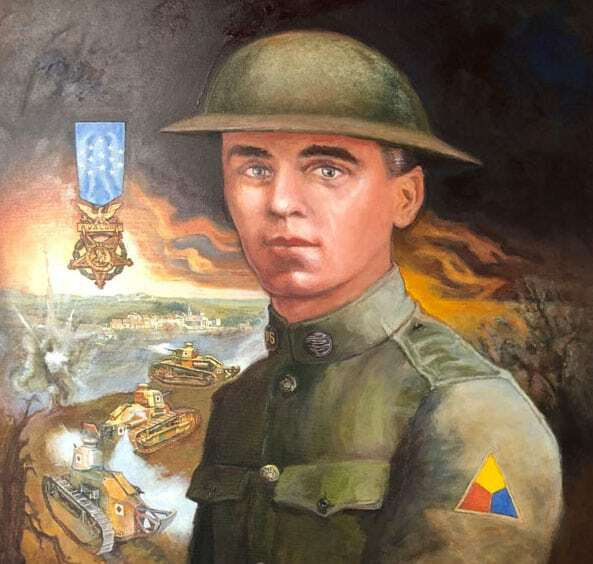 Roberts was the second tanker to be awarded the Medal of Honor. In addition, he was awarded the French Croix de Guerre with Palm, the French Military Medal, and the Italian War Cross. Corporal Roberts is buried in the Meuse-Argonne American Cemetery in northern France, near where he died, with more than 14,000 of the more than 26,000 soldiers who died in that offensive. Camp Nacimiento was renamed Camp Roberts by General Order No. 1, War Department, on January 10, 1941, in his honor. It is the only Army Installation to be named for an enlisted man rather than a General. 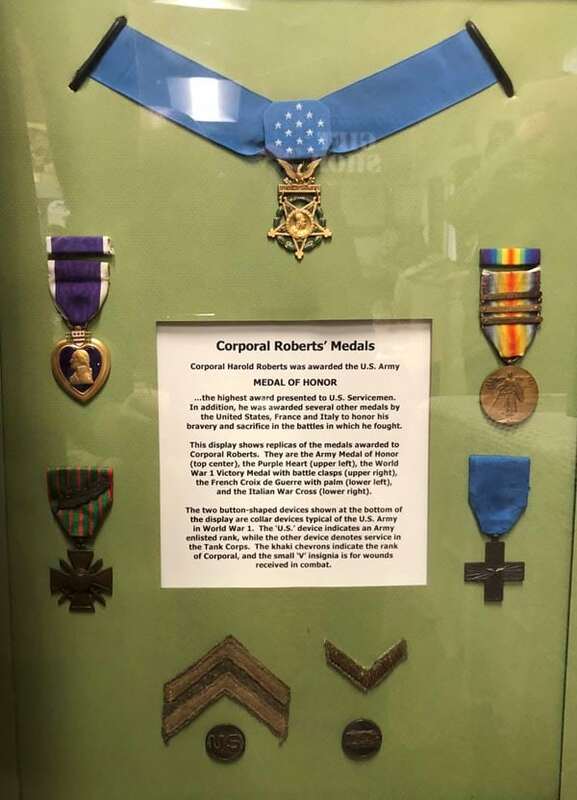 The Chairman/Curator of the Camp Roberts Historical Museum wrote Roberts’ biography as a fund-raiser for the museum, and it is available in the museum gift shop. 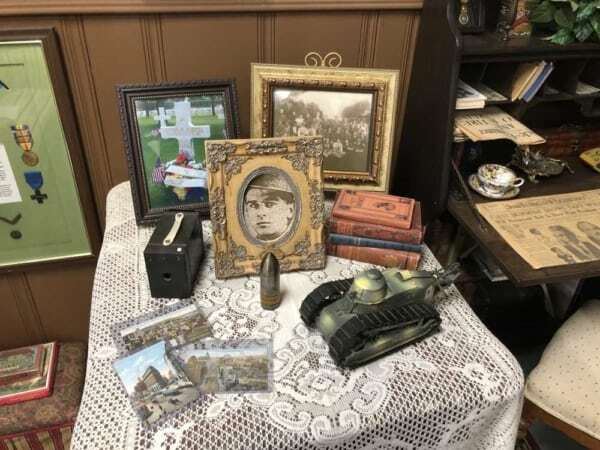 The museum has a large exhibit on our hero in the recreation of the parlor of the home of his grandmother, where he spent his preteen and teen years. Through the American Battle Monuments Commission, they also have a large flower arrangement placed upon Corporal Roberts’ grave every Memorial Day weekend. Place and date: In the Montrebeau Woods, France, 4 October 1918. Corporal Roberts, a tank driver, was moving his tank into a clump of bushes to afford protection to another tank which had become disabled. The tank slid into a shell hole, 10 feet deep, filled with water, and was immediately submerged. Knowing that only 1 of the 2 men in the tank could escape, Cpl. Roberts said to the gunner, ‘Well, only one of us can get out, and out you go,’ whereupon he pushed his companion through the back door of the tank and was himself drowned. 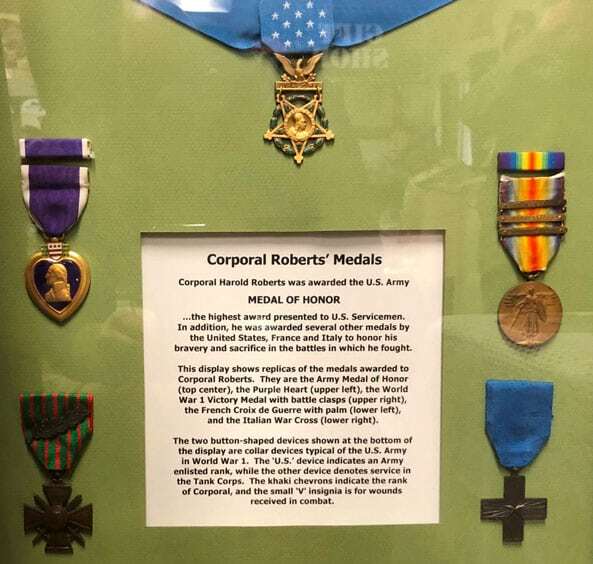 Where is Corporal Roberts’ Missing Medal of Honor? 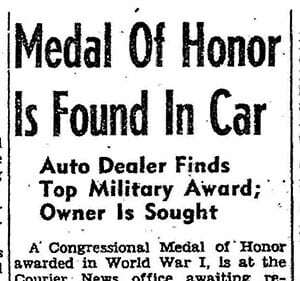 After his father, the last member of his immediate family, died in the early 1920s, Corporal Roberts’ Medal of Honor went missing. In the 1940s, it resurfaced in a used car in Arkansas, then went missing again. Letters of inquiry to the Department of Defense and the National Archives have turned up nothing. 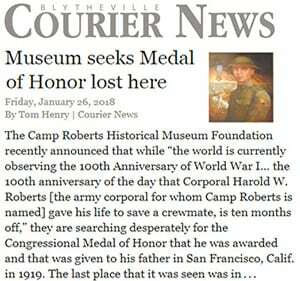 The Camp Roberts Historical Museum is greatly interested in locating this missing Medal of Honor, since for anyone except family to have it is illegal. His name is inscribed on the back. If you have any information that might lead to solving this mystery, please contact us!